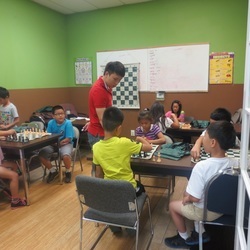 We offer different classes to help our students to improvement their chess skills and tactics. We teach students the strategies of opening and ending a game while emphasizing the importance of the middle section of a game. In Game Classes, students will face each other and the coach will review each game with them with feedback and move analysis. Students will learn firsthand from the Master's expertise and benefit from new and reinforced chess concepts. In Tactics Classes, students will learn how to play chess step by step systematically using different subjects. We have designed our own work book to help our kids improve their chess skills.